Better Ingredients, Better Products, Better Results! Whey protein from grass-fed cows free rBGH) and naturally sweetened from leaves of the stevia plant. A natural pre-workout that provides clean energy for better workouts without the crash or jitters from harsh stimulants. We produce our supplements for women, not 250 lb men! We support our customers and make products to help them reach their goals. We source the highest quality ingredients and use to artificial sweeteners or unnecessary fillers. Using GMP compliant and FDA regulated guidelines; our products are verified through random and independent laboratory testing. This protein is awesome! The nutrition is perfect - gluten free and no hormones! The customer service is the best I've ever experienced also. I will continue to buy this product! 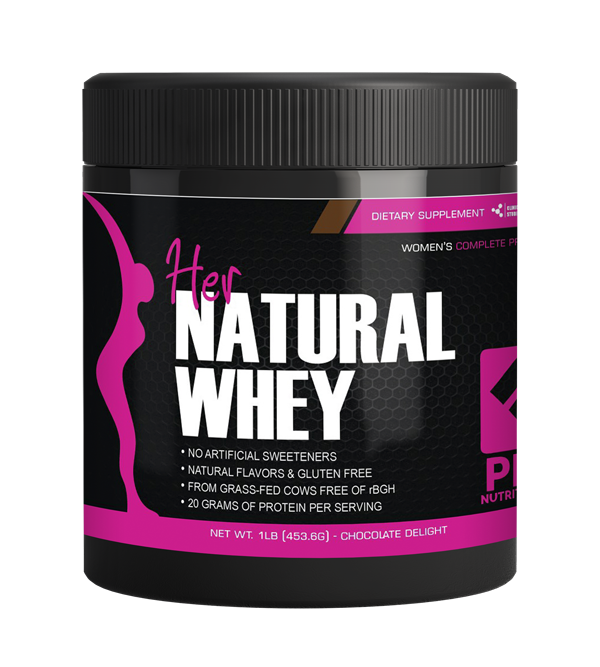 I've been using Her Natural Whey a little over a week now & it's great! Not only does it taste good it helps me recover from my workouts at a quicker pace. I would definitely recommend this product. I've been using this product for about a week now and I absolutely love it. It honestly is the best tasting protein powder I ever tasted.... I feel like I am more energized after drinking this also I notice it makes me feel full so I'm not tempted to eat as much. I definitely recommend this product to my friends. What a great product! The ingredient list is simple (which is HUGE to me). There are no artificial sweeteners. The powder mixes easily with water in a shaker bottle so your drink is smooth-no clumps. I have boosted energy and endurance and find my performance is better. I highly recommend this!! *These statements have not been evaluated by the FDA **These products have not been evaluated by the FDA and are not intended to diagnose, treat, cure or prevent any disease. .